From time to time I'll fill you in on cool blogs I find in addition to books. Today I met a new author through a mutual friend. Jerome Teel has his first book coming out in September. 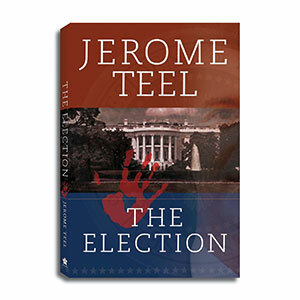 The Election is a Christian political thriller that I can't wait to get my hands on. The D.C., policy wonk part of me still lives strong. Until then, I'm contenting myself with reading Jerome's blog Christian Political Fiction . If you like an eclectic mix of politics and faith, I really think you'll like his blog. Check it out. Cara, I greatly appreciate your blogging about my book. It is exciting to know that its release is imminent. Politics and faith are an interesting mix and many people attempt to write/talk about them together. Some (including some Christians) don't believe the two should be mixed. I disagree and hope the readers of The Election realize that we need individuals with a Christian worldview involved in politics. Thanks again for your wonderful post. I couldn't agree with you more, Jerome. My eight years in D.C. conservative non-profits made me a life-long believer that we need Christians in all areas. We can't segregate sections of society and say Christians can't or shouldn't influence those. Thanks, Cara, for letting us know about Jerome. Looking forward to his book. I am looking forward to reading Jerome's book when it comes out. I think it will be a winner!